We arrived in our 5th country after a 12 hour bus ride with 2 changes. The Malaysian border was a breeze (UK residents get a free 90 day stay) and the biggest task was finding a place to stay. After changing our remaining Baht for a fairly reasonable rate at a money-changer on Lebuh Chulia, we ended up coming back to that same road and checking into the New Banana Guesthouse. 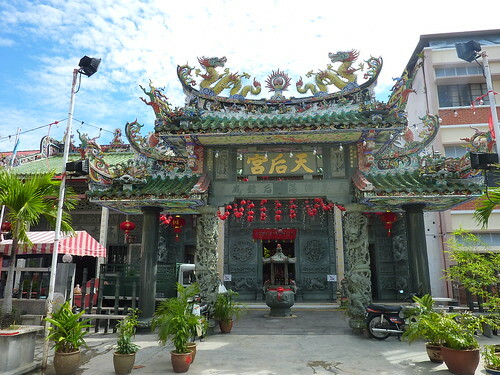 They appear to be a chain – we saw 4 Banana guesthouses and boutique hotels within a 1 mile strip. We managed to get a dinky little room in the back of the hostel with a (gasp!) shared bathroom – only the third we’d had since travelling: flashpacking or what? – plus air-con for 40 Malaysian Ringgit, about eight quid. It wasn’t the nicest place to stay but it was adequate, and did the job. Walking down the street, we stopped at a place that sold roti, and bought five for a quid which filled us up nicely. 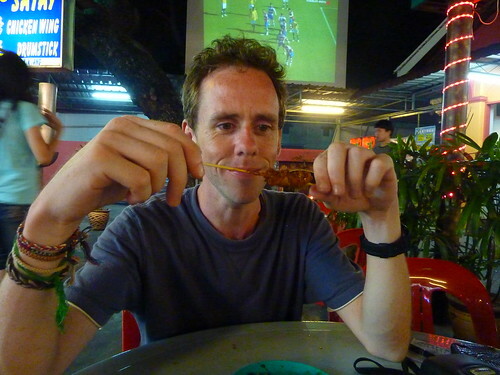 You aren’t supposed to use your left hand to eat in Malaysia; similar to India, it is considered unclean. Tearing a roti one-handed is surprisingly difficult, but we muddled through. I’m sure our friend Ravi will be able to teach us uncouth Brits a few tricks when we meet up with him in Canada in a few months. That was about all we could manage for the night, so we crashed out ready for a packed day of activities on the morrow. 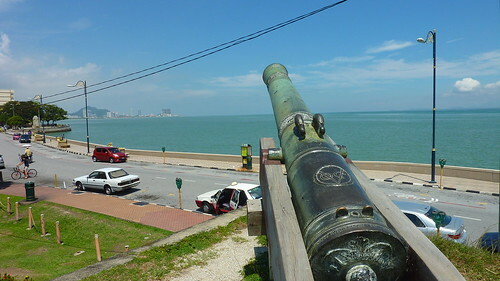 The first thing we’d noticed about Malaysia was how modern it was in comparison to the other places in SE Asia we’d been. We were told that Malaysia was the most developed country in SE Asia (obviously not including the island/state/city of Singapore), and it showed. They had road markings. The roads were pretty much pothole-free. The streets were a lot, lot cleaner than, for instance, Vietnam and Cambodia, and on a par if not better than Thailand. The people also appear to be the friendliest we’ve met as well. Perhaps it’s the melting pot of cultures which makes them so tolerant of outsiders, as with a population consisting of Chinese, Indian and Malay, pretty much everyone was originally an outsider. Georgetown Museum – fairly bland permanent exhibits telling the story of how Francis Light established Georgetown and its subsequent flip-flopping ownership between various nations. There was also a games corner where they laid out a few traditional board games with the barest hint of how to play them. 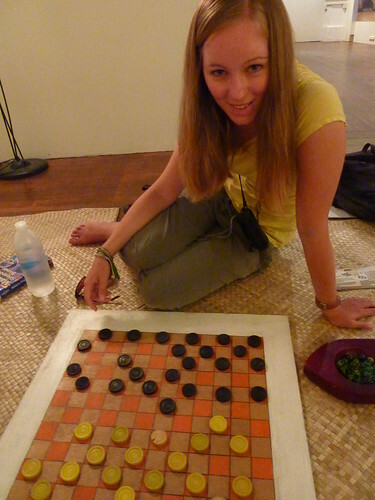 One of them looked suspiciously similar to draughts, so we played that using draughts rules. I’m not sure if that was how it was meant to be played but the important thing to note was that I won. Here’s Gilly approximately 150 seconds before she got thoroughly trounced. Note in particular her happy smile which was brutally wiped from her face following my devastating play. 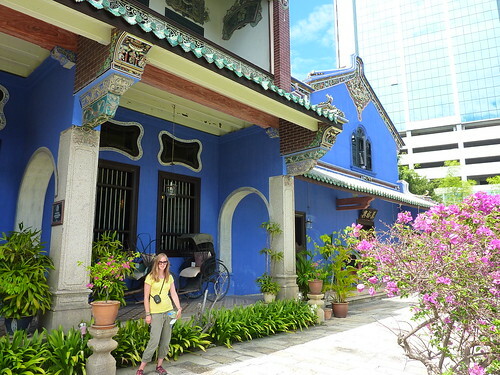 After a lunch at Sri Ananda Bahwan (very odd staff, excellent tandoori chicken) we moved on to my highlight of Georgetown – Cheong Fatt Tze Mansion. 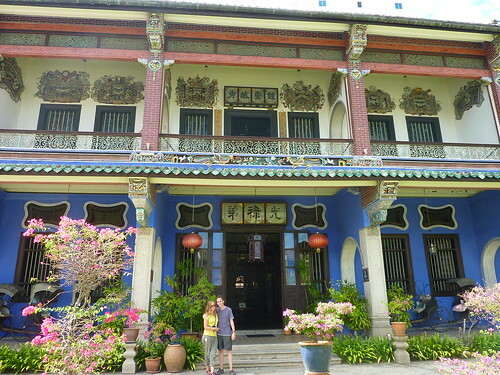 Recently listed as one of the top mansions in the world, this is an indigo-coloured building with excellent Chinese decoration both inside and out, but what made it great was the fantastic tour given by “Sally” who spoke flawless English and took us around the place for the best part of an hour. 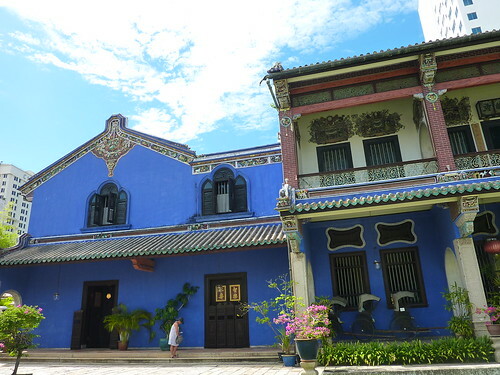 It was the setting of the film Indochine and has been restored by a group of dedicated conservationists to its former glory – it doubles as a guesthouse as well, should you want to stay there (starting at around £70 a night, it might be worth splashing out on – we didn’t get to see the rooms though). 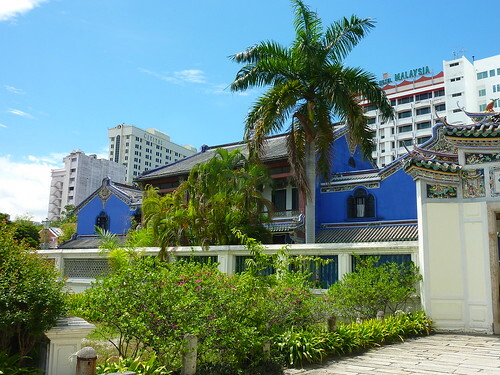 It was built in the 1880s by a very wealthy Chinese man (Cheong Fatt Tze) who got rich on trade, and then invited his millionaire buddies to build mansions in the same road as him. The majority of the other buildings have since been knocked down or converted, but this one remained. 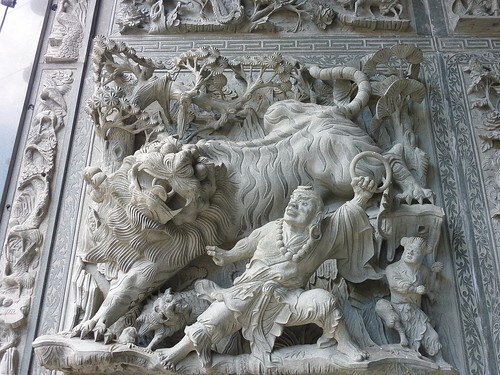 Built on the dubious tenets of Feng Shui (e.g. putting a particular piece of furniture in one corner brings positive energy to a room, but turning it a few degrees to the left or sticking a vase on it means that evil spirits will enter and eat your entrails – I may be paraphrasing somewhat), it has symmetry and kookiness throughout. For instance, the entrance to the main hall has a raised threshold you need to step over. This is designed so that you lower your head to see where you’re putting your foot, and in doing so inadvertently bow to the shrine at the end of the room. Then there’s the Chinese tradition of building houses on a slope to resemble a dragon’s back. 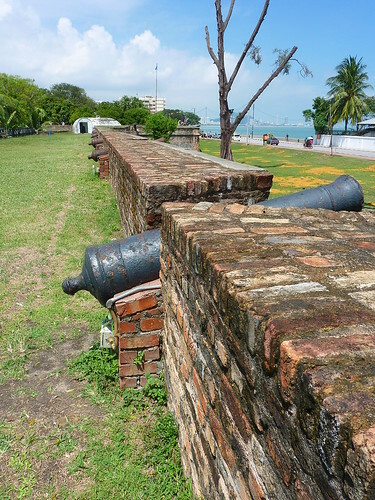 Since the building foundations were flat, Cheong Fatt Tze had to improvise, and he simply built the back half of the house one step higher than the front half, so when you look across the room you are actually watching it “slope” down. 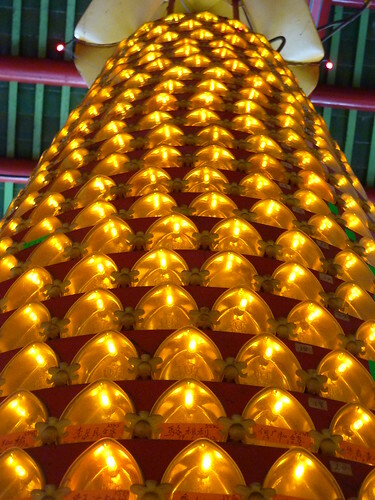 Numerology (the study of the significance of numbers) is important to the Chinese. The house was given the number 14, but 4 is an unlucky number to them. Fortunately, like most superstitions, there are “get outs”. You don’t like the number 14? Well, why not say that 14 is actually 1 and 4, and 1+4 = 5? Five is a good number. There you go, problem solved. You may come across similar “adjustments” in temples, where the faithful shake jars of numbered or labelled sticks in front of a statue of a deity until one of the sticks falls out. If they don’t like what providence has bestowed on them, they put it back in the jar and try again until they get an outcome they’re happy with. I find the psychology behind superstition (and indeed, religion) fascinating. The house was obviously built to last – Cheong Fatt Tze imported floor tiles from England and cast iron supporting pillars from Scotland. Only the best will do, and apparently the best at that time came from the UK. 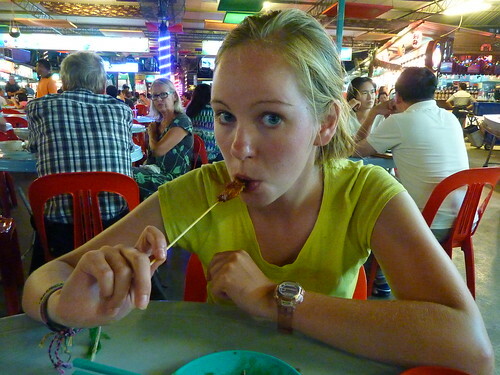 We went to the night market food court for dinner to try out some chicken satay. 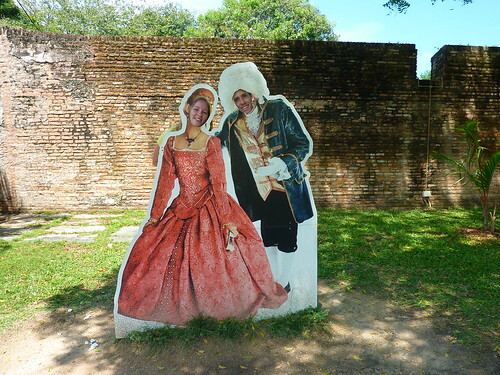 Unsurprisingly, the locals do it a lot better than we do at home, so we scrummed ourselves silly on the stuff. Apparently regular readers of this blog think I am obsessed with ice cream, cakes and bakeries. This is true. I love all three. A visit to a place without trying at least one baked good or new ice cream is not a complete experience. To this end, we got some German Chocolate Cake from a place called Maxim’s on the way back from the night market. I can’t tell you what makes it German (Gilly is the baking expert); maybe it was the number of layers. Either way, it was great. 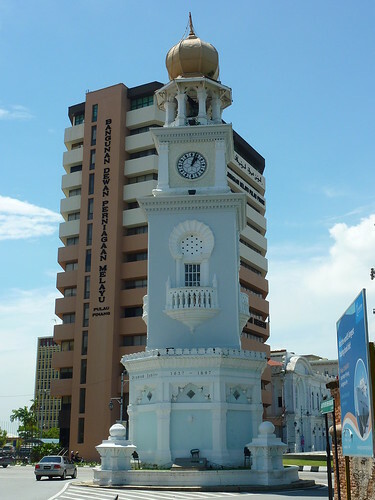 We were getting itchy feet and there wasn’t a whole lot else we wanted to do in Georgetown, so early the next morning we took a bus to Ipoh, the third largest city in Malaysia.